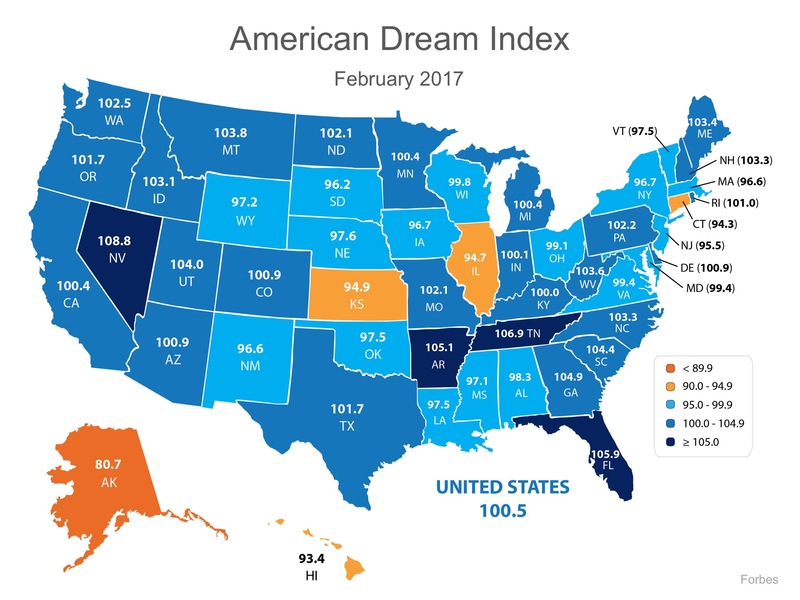 Nevada Leads The American Dream Index! The monthly index measures several different economic factors, including goods-producing employment, personal and commercial bankruptcies, building permits, startup activity, unemployment insurance claims, labor force participation, and layoffs. The national index score was rounded out to 100 in January and saw a modest jump to 100.5 in February. Alaska represented the lowest score on the index at 80.7, due mostly to the recent collapse in oil prices. Nevada came in with the highest score at 108.8, boosted by big gains in goods-producing jobs and new construction activity. The full results can be seen in the map below. The American Dream, for many, includes being able to own a home of his or her own. With the economy improving in many areas of the country, that dream can finally become a reality. Previous Previous post: Google’s Big Announcement – What Does This Mean For Home Buyers & Sellers In Reno-Sparks? Next Next post: Income Taxes Paid? Looking To Improve Your Tax Position in 2017?